Below is an interview with Christine Araquel-Concordia and Johneric Concordia. What are the origins of The Park’s Finest? How much has bbq been a part of your life? Johneric Concordia: Our family’s always been known to cook for community celebrations and events. And every time we passed by storefronts, the family dreamed of what it would be like to open a restaurant in those places. As our crew grew up together in the neighborhood raising families, participating in cultural and community events, our contribution always revolved around the food aspect. Eventually, we took part in SIPA’s small business program and developed a business plan to try out our hand as a catering business. Christine Araquel-Concordia: Growing up, we were always looked after by community leaders. I later met the crew in high school when we organized as youth. Taking part in events, food always added to the experience of doing good work together and cooking brought folks closer. What we learned as organizers with organizations like People’s CORE added to our skill set in further developing our strategies, approach, and ways to engage support in eventually creating and carving out a physical space in our community. Are there any dishes that you had to put on the menu? Why? Johneric Concordia: Mama Leah’s Coconut Beef wasn’t something we initially thought would be part of the menu but when we fed the staff and performers at Tuesday Night Café, I’d sometimes ask Mama Leah to cook that particular dish. It was so well received, it continued to be requested to be added onto The Park’s Finest menu. It’s been our number one menu item. Christine Araquel-Concordia: Ann’s Cornbread Bibingka was always a hit too when it was brought to different events. The concoction didn’t exist before Ann whipped it up. People of all ages loved it. My personal favorite is the Short rib. It’s a massive, smoked meaty beef rib sliced off the bone into quarter inch pieces plated back on top of a rib. It’s a showstopper. What are some of the challenges you’ve faced growing your business? Christine Araquel-Concordia: Our founding crew didn’t have an educational background or experience in the restaurant and hospitality industry. We learned as we went. We utilized the local services of non-profit organizations to build our capacity. We tapped into expertise of the people in our community and colleagues in the industry. All of this guided us to figure out our first steps in developing the business and also in maintaining it. Lacking a lot of the working capital needed to start up, pooling resources with family and community support is really what helped us to open our doors. What are some of your favorite moments at The Park’s Finest? Christine Araquel-Concordia: When the episode of Diners, Drive-ins, and Dives first aired, we invited our family, crew, and community to join us and we all watched it together for the first time. From thinking it would be a great opportunity to be featured on the show to actually sitting and watching the feature play on the TV was surreal. 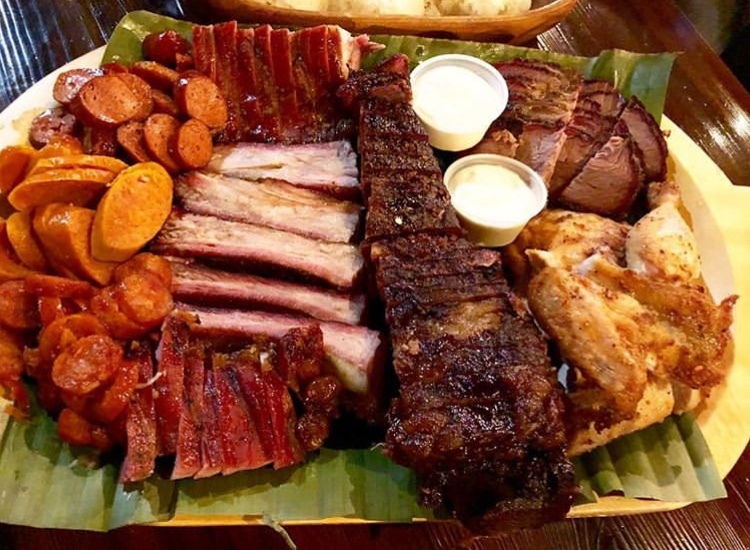 In that particular point in time, we witnessed something we didn’t think we’d get to see – and it was happening on a program that was being broadcasted across the country highlighting the story of Filipino kids in Echo Park who loved to BBQ together. Johneric Concordia: The belief and support from our family and community is the essential driving force. We are driven by the instilled principles of developing socio-political economic strength of a neighborhood from the ground up. This empowers those most impacted by policy and development to be vocal and part of a city’s future development and planning. We offer employment to the people in this community. We feed schools and non-profits in the area. We’re honored and take responsibility in being an institutional representation of a neighborhood’s character. Christine Araquel-Concordia: This neighborhood – Historic Filipinotown, Echo Park - has historically been culturally rich and dynamic as well as strengthened by values of cohesion and community action. The people of this neighborhood who’ve been a part of this fabric for decades want as much to be involved with the changes that are happening on the block and to be a part of its growth. We work hard to continue being a part of this neighborhood’s narrative. Being of this community, we want to be active in continuing to build up the neighborhood with our community – to be active in identifying and addressing our community needs, issues, concerns, and aspirations. What are your favorite community events you’ve been involved in? Johneric Concordia: Annually, during the LA Marathon, when 25,000 Angelenos face the toughest mile in the entire race, our restaurant rests upon a one mile incline that determines runners’ ability to finish the race. We bump music, pass out Gatorade and let them know that we are proud of them. What are some of your favorite dishes to make and to eat? Filipino or other. Johneric Concordia: Corned Beef Tortas. Nilaga. Beef Oxtail. Do you have any events/projects/special things coming up? Christine Araquel-Concordia: On January 27th, we’re hosting a book launch of “Journey for Justice: The Life of Larry Itliong”. This is the first Filipino-American history book for children on the co-founder of the United Farm Workers who led Filipinos in the Delano Grape Strike in September 1965. This was written by Gayle Romasanta and the late Dr. Dawn Mabalon. A book signing and discussion will be held with Gayle Romasanta.